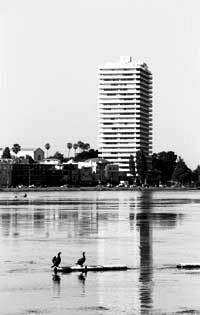 I Could Do That - Photographs of Lake Merritt in Oakland. 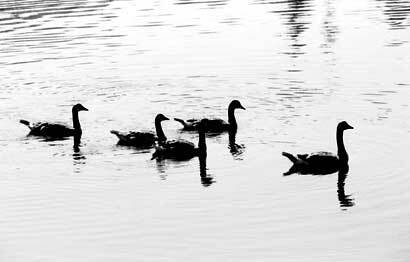 The photos were shot yesterday at Lake Merritt. This is the first time I've shot cute goose pictures and I count these a first attempt, a first look at a subject where I need to come back and go over the negatives, examine a print, think how I can shoot them better, then get out and shoot them again. Run those later pictures, shot with greater knowledge, instead. Or otherwise say the hell with it and put them where you see them now, play Freecell and drink beer instead. I did get a couple of pictures of the goose rebellion I found brewing along the lake shore that I described yesterday and I'll eventually run those, after the Freecell. And the beer. And, maybe, the Fourth of July. I'm reading my Freecell statistics. Seventy-two percent. Two years ago I was clipping along at 80, but maybe I was more careful then, more serious. I'm also looking at the number of games played since I last cleared the total, twenty less than one thousand. Before I started this batch it was 500 games played, and then, before that, it was 500 again, on back infinitum. You form an idea, after a while, of what it might take to get good at Freecell. I know the facile stuff, the look one or two moves forward, the less than obvious combinations that can be played with good result, but I also know I'm stuck at the level of beginner, unwilling to expend the energy required to move forward. Perhaps, like chess, I don't have the memory or intellectual capacity to master the next steps, to move off beyond the bottom, but stuck forever a Freecell beginner, forever stuck in Freecell 101. Then, again, it is only Freecell. Why would anyone want to spend the time and intellectual energy to master it, except Freecell is not a bad simile for a lot of other things in life. My participation in other games, the photography and journal keeping, for example. You can shoot photographs forever, you can write for miles and miles, and, like Freecell, if you don't make a decision to take that next required step, if you don't push, you will be a beginner forever. Forever shooting snapshots, forever writing, just nudging, never crossing the edge of "good enough". Thus is life. They say learning a discipline, really learning a discipline will eventually reveal the secret core of all disciplines, reveal the knowledge of all paths that lead eventually to the light. I've always liked the Samurai epics, for that reason, as the good ones reveal that struggle toward the light - enlightenment - and their stories ultimately wrestle with the question of finding that path. Which is good stuff. I've often wondered if the things I've done in my life are not unlike my Freecell habit: Time spent, chapters attempted, but never a slip into serious practice: Life, friendships, marriage, family, hobbies, work, school, take your pick. And I'm ambivalent about it. I say life doesn't have an "about". Life encompasses about, about isn't nearly big enough to encompass life. Life isn't about this or about that, it's about everything we know and everything we don't and maybe playing a lifetime of Freecell games at the beginner level is enlightenment enough. And that sounds good, but that's the point when I start to worry. Because maybe one day I'll have a realization, lying there in the hospital, the sky opening up to illuminate my entire life - every second, every minute, every hour - and a judgement will come: "You fucked up, boy-o, you never got off your duff. Get back in line and do the cycle another time". One of the lesser known clauses in the Karma contract, by the way, according to the better texts, is you don't necessarily get to come back right off the bat as a California middle class guy with a God given right to high speed Internet access. You may first have to live a few million lives as a toad or a worm or a cow or a cockroach or an old forest dwelling owl before you get another shot, and then, who knows, maybe you'll slip in at an inconvenient time in a place named Treblinka, or Auschwitz. Which is to say, screwing up counts. Hi, ho. These are thoughts you have, I suppose, when you're given to sloth, when you've lived a life where you've never met an attractive, makes you want to get up at six and work your fingers to the bone til midnight, ambition. Or, maybe, when you find yourself looking over your contact sheets and realize you should probably go back next week and shoot them again, get the light right, the focus better, you fire up Freecell instead, and think, "yes, I could do that". 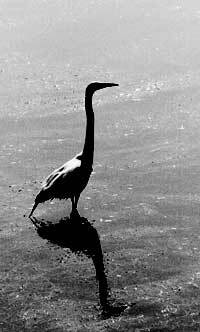 The photographs were taken at Lake Merritt in Oakland. The quote is attributed to an English professor at Ohio University.